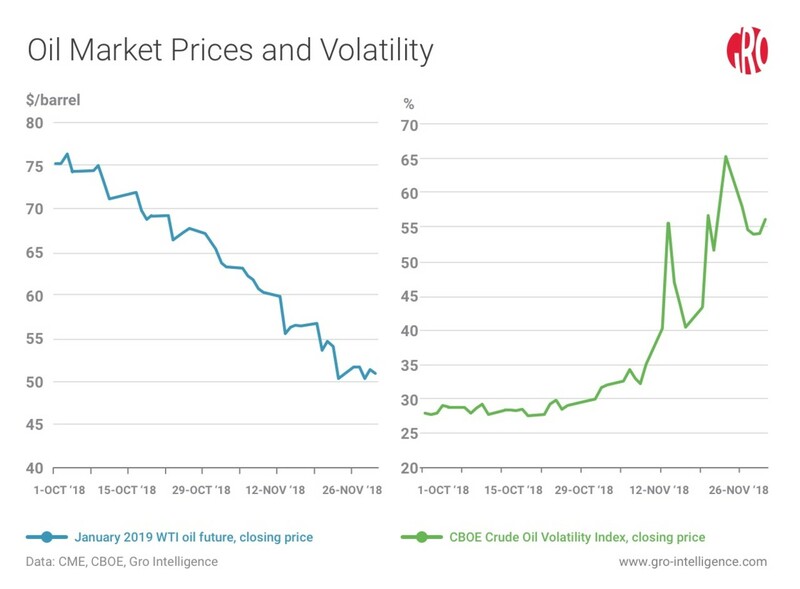 Volatile oil markets are buffeting more than just the energy industry—they are also causing collateral damage to corn, soybean, and other agricultural commodities futures. As oil prices gyrate, commodity speculators have sought to limit risk by reducing their exposure to the sector. That increasingly has come to mean unwinding positions not only in oil, but also in a wide range of other commodities. And the growing use of investment products tied to popular commodity indexes has magnified this trend, as traders wanting to get out of energy holdings end up abandoning a host of other commodity assets at the same time. Of course, futures markets are a zero-sum game—for every buyer there is a seller. While speculators unwind their positions, commercial end-users, such as crop processors and food producers, have taken advantage of price dips to hedge future supplies. Indeed, data from the Commodity Futures Trading Commission on corn and soybean contracts shows that, as money managers and other noncommercial players have reduced their gross long positions, comparable positions held by commercial parties have increased. 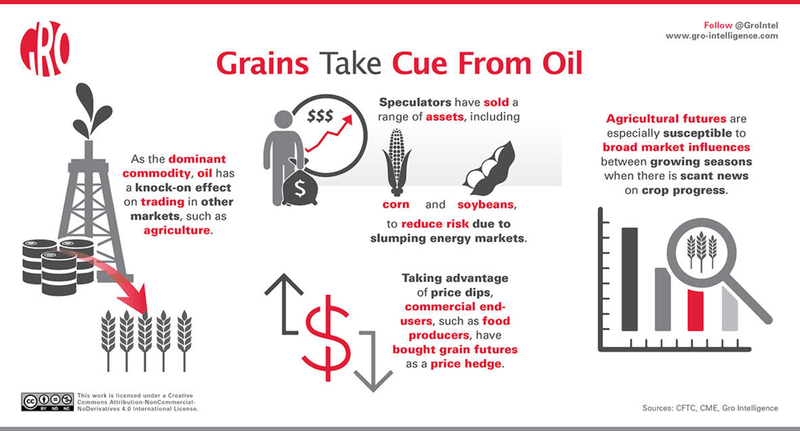 Ironically, speculators seeking to shield themselves from market volatility in oil might be sowing the seeds for a volatile market in agricultural commodities in coming weeks. When news begins to emerge about the progress of current corn and soybean crops, especially in Brazil and Argentina, any bullish signals, such as poor weather, could drive investors quickly back into the market. The oil market closed November suffering its worst monthly price decline in a decade. The nearest-to-delivery West Texas Intermediate (WTI) futures contract, for delivery in January 2019, fell by more than 22 percent on the month. This follows an 11-percent drop in October. The sharp moves propelled a common measure of oil-market volatility, known as the CBOE Crude Oil ETF Volatility Index, to surge by 108 percent over that same two-month timeframe. Putting pressure on oil are concerns about economic growth due to a steady rise in US interest rates, which has reduced demand-growth estimates. On the supply side, US shale production continues to outperform analysts’ expectations, and the market has become skeptical that OPEC, whose member countries are scheduled to meet on Dec. 6, will follow through on a promised production cut. Worries about economic growth and excess supply have hit prices on the January futures contract for West Texas Intermediate crude oil (left chart). The sharp price moves have sent the CBOE Crude Oil Volatility Index steeply higher (right chart). 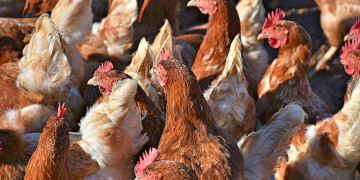 Of course, energy-price fluctuations can impact the supply/demand fundamentals of agricultural and other commodities over the long term, because of the energy requirements needed for growing and processing crops. But in the short term, parallel moves in oil and agricultural futures contracts are generally driven by changes in investor positioning. 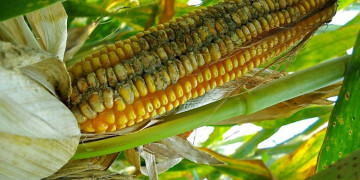 Agricultural markets are particularly susceptible to outside market influences in the fall and spring, the so-called shoulder periods between weather-sensitive parts of growing seasons in North and South America. That’s when trading volumes are thinner, and there are few fundamental metrics, such as production quantities and yield, to help guide trading decisions. During the principal growing seasons, key fundamental news and data will mostly overshadow external influences. There are two main ways in which oil market prices and volatility can impact speculative positioning in agricultural markets. First, a shock in volatility of one asset can cause traders, particularly those employing leverage, to de-risk their entire portfolio. Second, buying or selling of commodity-index products, which have become much more prevalent in recent years, leads to simultaneous movement of positions in multiple markets. Most hedge funds and asset managers use a concept called Value at Risk (VaR) to measure the risk of different assets in their portfolio. When there is a shock to volatility, regardless of the direction of prices, investors are forced to reduce leverage in positions throughout their portfolio to maintain the same amount of overall risk. For a fund invested in both oil and agriculture, that creates a correlation in positioning when volatility spikes. Another aspect of the de-risking behavior is driven by the migration of the typical commodity speculator from smaller, commodity-focused hedge funds to some of the world’s largest asset managers. In the past, the majority of active speculators in commodity markets were hedge funds with an extreme focus on supply/demand fundamentals. However, poor performance since the 2008 financial crisis has forced many commodity funds to shut down. At the same time, the negative real-interest-rate environment administered by the Fed has brought nontraditional commodity investors into the space as a hedge against future inflation. These types of investors are much more likely to hold a broad basket of commodities rather than focus on individual market fundamentals. Various research studies have been published promoting commodities as a third investment asset class after equities and fixed income. In addition to the inflation-hedging aspect, studies have observed a long-term negative correlation to other asset classes, which reduces the overall amount of risk in a portfolio when commodities are included. As mentioned above, nontraditional commodity investors tend to group commodity markets together when making their investment decisions, which has contributed to the popularization of commodity-index products. These products, the majority of which are tracking the Goldman Sachs Commodity Index (GSCI) or the Bloomberg Commodity Index (BCOM), are a basket of commodity markets which attempt to replicate broader inflation indexes. Commodity indexes are weighted by production and liquidity metrics, and, therefore, lean heavily toward the energy sector for price performance. As an example, the GSCI is approximately 70 percent energy. Although the BCOM is lower at around 30 percent energy, that segment still represents the biggest component of the index. Investors who have positions in those index products may disregard the agricultural share when making trading decisions, given that the energy sector drives most of the profit-and-loss performance. In October and November, gross long positions in corn and soybeans held by speculative interests fell by 11% and 10%, respectively. Speculators are defined as the sum of the managed money, other reportable, nonreportable, and swap dealer categories in the CFTC’s Commitments of Traders report. Given the dynamics described above, at least some of this reduction in positions is likely caused by influences from nonagricultural markets, specifically oil. 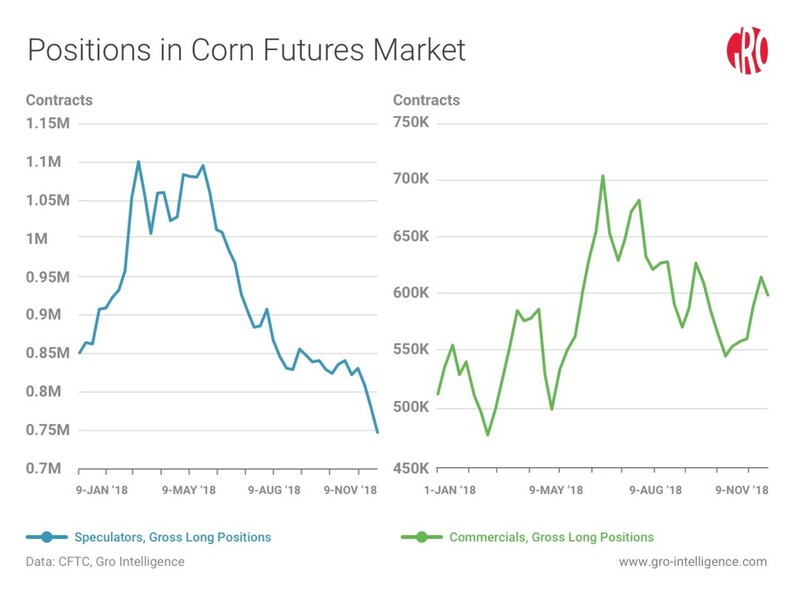 Data on gross long positions for corn futures on the CFTC show a sizable reduction in recent weeks on the part of commodity speculators (left chart). Meanwhile, end-users of corn, such as processors and producers, have been adding to their long positions (right chart). While commodity investors have reduced their exposure to a range of assets, end-users have been adding to long positions. End-users comprise producers, merchants, processors, and users, as categorized in the CFTC Commitments of Traders report. Corn end-users have been building long positions since mid-October, while soybean end-users have been buying following the November contract expiry in late-October. These traders tend to be much more selective and have longer holding periods than noncommercial traders. Given this activity, it appears that commercial traders see value at current price levels from a long-term hedging perspective. Corn and soybean markets are set up for a rally from a positioning standpoint following the significant reduction in commodity speculator length. If there is any adverse event during the South American growing season, both markets have plenty of upside potential given the positioning backdrop. Bullish signals might not come to pass, however. After the severe drought in South America in 2018, a normal start to the growing season has allowed planting to take place well ahead of normal. Ample rains in recent weeks, and more in the forecast, have analysts expecting very strong yields this year. 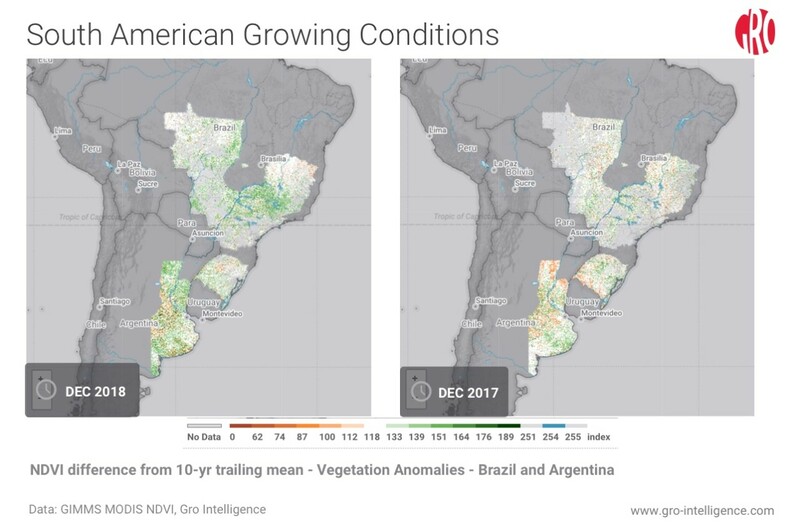 NDVI for the principal corn and soybean growing regions of Brazil and Argentina show relatively healthy conditions currently (left map) compared with the same time last year (right map). 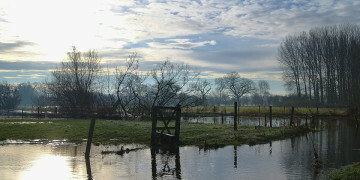 In 2017, a severe drought set in on the region in subsequent weeks. The most recent estimates from the USDA, published in November, forecast bumper 2019 crops for both corn and soybeans in South America. Brazil’s corn production is forecast to rise 15 percent to 94.5 million tonnes from 82 million in 2018, and Argentina’s production is expected to increase 33 percent to 42.5 million tonnes from 32 million in 2018. Brazil’s soybean production is forecast to rise 1 percent to 120.5 million tonnes from 119.8 million in 2018, and Argentina’s production is expected to increase 47 percent to 55.5 million tonnes from 37.8 million in 2018. Gro Intelligence’s own yield model for Argentina soybeans will begin showing signals for next year’s crop in January. Last year, the Gro model was well ahead of USDA forecasts in predicting the weak yield due to the drought.